We dig and set our gate posts greater than 4′ deep and use 12′ posts on each side allowing us to extend the posts beyond the height of the fence and connect them with a 2x8 header over the gate. Not only does this add allure to the entrance but it will ensure that your gate will continue to operate without resistance for years to come. 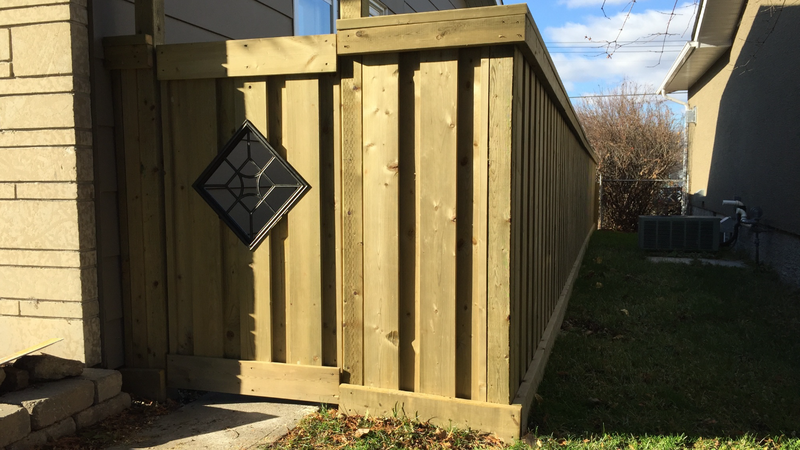 Each standard man-gate measures 36″ to 42″ wide and will match the fence pattern unless otherwise specified. Hardware includes: two gate hinges, four corner braces, as well as a standard gate latch. Choose a decorative insert to customize your gate. Nuvo iron offers a variety of different shapes and sizes that can be seen HERE. Let us know if you have any unique circumstances which will require atypical access to your yard. We are more than happy to design a custom gate to fulfill your needs. Double Gates and Sliding Barn Gates are also available for these unique situations.